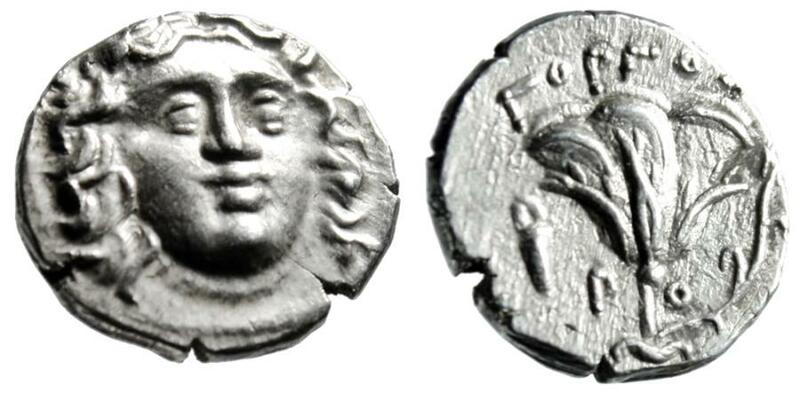 Islands off Caria, Rhodes (Rhodos) AR Drachm. Circa 205-190 BC. Gorgos, magistrate. Obverse: Head of Helios facing slightly right. Reverse: Rose with bud to right; bow in bowcase to left, GORGOS above. References: Ashton 288; SNG Keckman 582-4. Size: 15mm, 2.80g. Numismatic Notes: Choice EF with areas of luster! A stunning portrait of Helios done in fine style! Troas, Possibly Kolone AR Hemiobol "Helmeted Athena & Stellate Incuse Pattern"